New York: Alfred A. Knopf, 2010. First Edition. New. First Printing. A Fine copy of the earliest state of the third book in Larsson's Millennium Trilogy, a publishers tapebound manuscript, printed on 8.5"X11" paper with an acetate cover. While we can only speculate on the actual number of these that were produced, we do know this much: this is likely the earliest version of the book in the US, preceding the uncorrected proof copies by five months. The third book in Larsson's trilogy had an announced First Printing of 500,000 copies, and despite only being out for a few months, has gone into nearly ten printings that we've seen. An international publishing sensation that has already produced a trio of successful Swedish films, with the series of American films already in production. David Fincher is directing The Girl With The Dragon Tattoo, starring Rooney Mara, Daniel Craig, Stellan Skarsgård, and Robin Wright. It should be noted that any of Larsson's books in this format are rare, and though we've seen less than a handful of proof copies for this title, we've yet to see another one of these. FIRST UK EDITION, FIRST PRINTING (complete number line to 1) Maclehose Press, London, 2009. SIGNED by the TRANSLATOR (Reg Keeland) directly on Title Page. FINE/FINE. Dust Jacket Bright in Brodart protective cover, Clean, no wear, no tears, not price clipped (£18.99). Text Clean, no marks. No remainder mark. Binding Tight and Square. Not ex-library. Not book club. Books are Carefully Packed and Shipped Daily with Delivery Confirmation from Dry, Smoke-Free shop. Complete Satisfaction Guaranteed. Knopf, NY, 2009. 1st edition. Hardcover. Fine/Fine. "In the concluding volume of Stieg Larsson's Millennium trilogy, Lisbeth Salander lies in critical condition in a Swedish hospital, a bullet in her head. But she's fighting for her life in more ways than one: if and when she recovers, she'll stand trial for three murders. With the help of Mikael Blomkvist, she'll need to identify those in authority who have allowed the vulnerable, like herself, to suffer abuse and violence. And, on her own, she'll seek revenge - against the man who tried to kill her and against the corrupt government institutions that nearly destroyed her life." [Pub Info] In Fine condition. The first author to sell more than 1 million e-books on Amazon. STATED 1ST US EDITION. 2011-09-06. New. Ships with Tracking Number! INTERNATIONAL WORLDWIDE Shipping available. Buy with confidence, excellent customer service! New York: KNOPF, 2010. Book. Fine. Hardcover. Signed Copy. First Edition/First Printing. A square solid tight clean un-read as new copy. Book three of the Dragon Tattoo trilogy by the late author. This copy has been signed by the translator Rej Keeland. This purchase includes a copy of my ticket for the signing event and a photo of Rej signing books. THIS COPY IS IN MY POSSESSION AND NORMALLY SHIPS NEXT DAY..
New York: KNOPF, 2010. Book. Fine. Hardcover. Signed Copy. First Edition/First Printing. A square solid tight clean carefully read copy. The 27.95 chrome jacket has some rubbing wear to the rear panel else fine.. Book three of the Dragon Tattoo tilogy by the late author. This copy has been signed by the translator Reg Keeland and includes a photo of him signing books and a copy of my ticket from the signing event. THIS COPY IS IN MY POSSESSION AND NORMALLY SHIPS NEXT DAY..
Maclehose Press, 2009. First UK edition-first printing. Hardcover. New/New. Mint condition.Maclehose Press,2009.First UK edition-first printing(10 9 8 7 6 5 4 3 2 1).Green hardback(silver lettering to the spine) with Dj, both in mint condition.602pp.Price un-clipped.Heavy book. Product Description: Salander is plotting her revenge - against the man who tried to kill her, and against the government institutions that very nearly destroyed her life. But it is not going to be a straightforward campaign. After taking a bullet to the head, Salander is under close supervision in Intensive Care, and is set to face trial for three murders and one attempted murder on her eventual release. With the help of journalist Mikael Blomkvist and his researchers at Millennium magazine, Salander must not only prove her innocence, but identify and denounce the corrupt politicians that have allowed the vulnerable to become victims of abuse and violence. Once a victim herself, Salander is now ready to fight back. New York: KNOPF, 2010. Book. Fine. Hardcover. Signed Copy. First Edition/First Printing. A square solid tight clean un -read as new copy. Book three of the Dragon Tattoo trilogy. Great book, great series, great author. This copy has been signed by the translator Reg Keeland. The purchase includes a copy of my ticket to the event and a picture of Reg signing books. THIS COPY IS IN MY POSSESSION AND NORMALLY SHIPS NEXT DAY..
London: Maclehose Press/Quercus, 2009. Protected in an acid-free archival acetate cover, bubble-wrapped and hipped in a box.. First English Language Translation. Hard Cover. As New/As New. London, U.K.: Maclehose Press, 2009. Book. As New. Hardcover. 1st Edition. First U.K. Edition/First Printing. Hardcover in unclipped dustjacket. 599 pages. The sequel to The Girl Who Played With Fire. In clear protective book cover. A fine copy. As new. Unread. From my smoke-free collection. Ships in well-padded box..
QUERCUS/LONDON: MACLEHOSE PRESS.. 2009. First Edition. 1906694168 . First English language Edition. Close to fine in a fine dj. (Slight bump to tip of one board. Hint of a mild spine lean) . Westminister, Maryland, U.S.A.: Alfred a Knopf Inc, 2010. 1st Edition . Hardcover. As New/Fine. 8vo - over 7¾ - 9¾" tall. The third and final novel in the international bestselling Swedish trilogy finds Lisbeth Salander recovering from a bullet wound and plotting revenge with help from her friend, journalist Mikael Blomkvist. Stated first United States edition. This is an absolutely beautiful copy that is exceptionally clean with no writing, marks, underlining, or bookplates. No remainder marks. Not an ex-library copy. Spine is tight and crisp. Corners are square, and the gray and black boards are clean, flat and true with virtually no wear. Dust jacket is not price-clipped ($27.95) and is also in great shape with just some light shelf wear/scuffing and some minor bumping to the upper spine. This collectible, as new/fine, first edition/first printing copy is protected with an archival mylar dust jacket cover. Satisfaction guaranteed! Westminister, Maryland, U.S.A.: Alfred a Knopf Inc, 2010. 1st Edition . Hardcover. As New/Fine. 8vo - over 7¾ - 9¾" tall. The third and final novel in the international bestselling Swedish trilogy finds Lisbeth Salander recovering from a bullet wound and plotting revenge with help from her friend, journalist Mikael Blomkvist. Stated first United States edition. Aside from a small (1/4") mark on the front free endpaper, this is an exceptionally clean copy with no writing, marks, underlining, or bookplates. No remainder marks. Not an ex-library copy. Spine is tight and crisp. Corners are square, and the gray and black boards are clean, flat and true with minimal wear, just a hint of bumping to the lower spine. Dust jacket is not price-clipped ($27.95) and is in great shape as well with just some minor edge wear, mostly to the upper edges, which have some small creases. The jacket also has some light scuffing as well on the metallic finish and fits a bit loosely. This collectible, as new/fine, first edition/first printing copy is protected with an archival mylar dust jacket cover. Satisfaction guaranteed! 2009-05-05. New. Ships with Tracking Number! INTERNATIONAL WORLDWIDE Shipping available. Buy with confidence, excellent customer service! London: MacLehose Press. 2009. First Edition; First Printing. Hardcover. Very Good in a Very Good dust jacket. Some edge wear with few small chips and tears. ; 8vo 8" - 9" tall; Original unclipped dust jacket protected by archival Brodart cover. All domestic orders shipped protected in a Box. .
2010-03-05. Good. Ships with Tracking Number! INTERNATIONAL WORLDWIDE Shipping available. May not contain Access Codes or Supplements. May be ex-library. Shipping & Handling by region. Buy with confidence, excellent customer service! NY: Knopf, 2010. First US edition, first prnt. Translated by Reg Keeland. Signed by Keeland on the title page. Book a little shaken, spine ends pushed with tiny bottom edge tear; foil dustjacket rubbed. Very Good conditiuon in a Very Good dustjacket with an archival cover.. Signed by Translator. First Edition. Hardcovers. The images are of the book described and not stock photos. Knopf, 2010. First Edition. Hardcover Hardcover. Fine Condition/Fine. First Printing of US Edition. Binding is tight, covers and spine fully intact. Deckled edges (rough cut). Text is clean and without markings. Dust jacket is now protected in a clear, removable, archival cover which will protect the quality and value of your collectible book for years to come. Book is currently being protected in (and ships in) a clear archival sleeve. Ships same day bubble-wrapped AND BOXED w/ standard domestic shipping. Free tracking. 100% Guaranteed. ISBN: 030726999X. ISBN/EAN: 9780307269997. 2010-02-03. New. Ships with Tracking Number! INTERNATIONAL WORLDWIDE Shipping available. Buy with confidence, excellent customer service! Alfred A. Knopf, N. Y.. Fine in Fine dust jacket. 2009. First U S Edition. Hardcover. 9780307269997 . Increasingly this third book ( and the last) by the author, the late Stieg Larsson, is getting very difficult to find in the First U. S. Edition. The last line on the copyright page states "First United States Edition". This is a very nice first edition that will satisfy any collector's requirements. Publishers price still intact on dust jacket. No names, writing, or marks in book. 563 pages. A very gently read book, dust jacket and book are in Fine condition. ; Standard Book Size. .
Maclehose, 2009. An immaculate copy of the first edition, first printing (10 9 8 7 6 5 4 3 2 1 on publications page). An unread copy.. First British. Cloth. As New/As New. 8vo - over 7¾" - 9¾" tall. 2010-07-01. New. Ships with Tracking Number! INTERNATIONAL WORLDWIDE Shipping available. Buy with confidence, excellent customer service! 2015-06-04. New. Ships with Tracking Number! INTERNATIONAL WORLDWIDE Shipping available. Buy with confidence, excellent customer service! 2012-02-03. New. Ships with Tracking Number! INTERNATIONAL WORLDWIDE Shipping available. Buy with confidence, excellent customer service! 2010-05-06. New. Ships with Tracking Number! INTERNATIONAL WORLDWIDE Shipping available. Buy with confidence, excellent customer service! 2010-01-06. New. Ships with Tracking Number! INTERNATIONAL WORLDWIDE Shipping available. Buy with confidence, excellent customer service! 2012-08-05. New. Ships with Tracking Number! INTERNATIONAL WORLDWIDE Shipping available. Buy with confidence, excellent customer service! 2010-03-07. New. Ships with Tracking Number! INTERNATIONAL WORLDWIDE Shipping available. Buy with confidence, excellent customer service! MacLehose Press, London., 2009. First U.K. edition. Translated by Reg Keeland. Octavo. pp [vi], 602. The third title in the Millennium Trilogy. Slight mark to fore-edge. Near fine in near-fine dustwrapper. Vintage Crime/Black Lizard. Used - Good. Good condition. Slightly dampstained. Vintage Crime/Black Lizard. Used - Very Good. Very Good condition. Vintage Crime/Black Lizard. Used - Good. Good condition. Stamped on page edges. Maclehose Press. Hardback. Fine/Fine. 2007. Hardback. Fine. First Edition. First Print. This book was purchased new, never been read,an excellent addition to your collection. Dust jacket is protected with a mylar cover. Books are packed and shipped in boxes. 2009-06-06. New. Ships with Tracking Number! INTERNATIONAL WORLDWIDE Shipping available. Buy with confidence, excellent customer service! 2010-08-07. New. Ships with Tracking Number! INTERNATIONAL WORLDWIDE Shipping available. Buy with confidence, excellent customer service! New York: Knopf Doubleday Publishing Group, 2010. First printing. Hardback. As New/fine +. 563pp, black quarter cloth with grey boards, silver lettering on spine. First printing of first U.S.edition. Dustjacket is pristine with no flaws on edges. Appears unread. New York: Alfred A. Knopf. Very Good+ in Very Good+ dust jacket. 2010. First US Edition; First Printing. Hardcover. 9780307269997 . A Very Good+ first american edition/first printing with some watermarking to the lower boards in a like dust-jacket with edgewear; The third and final novel in Stieg Larsson's internationally best-selling trilogy, author of The Girl With the Dragon Tattoo . 2015-01-01. Good. Ships with Tracking Number! INTERNATIONAL WORLDWIDE Shipping available. May not contain Access Codes or Supplements. May be ex-library. Shipping & Handling by region. Buy with confidence, excellent customer service! Quercus, London: Maclehouse Press, 2009. 1st Edition . Soft cover. Very Good. First UK edition, number line reads 10 9 8 7 6 5 4 3. Soft cover book in very good condition. Spine lightly creased. Questions welcome. We ship internationally from the United States and Canada every week. If buying internationally, please be aware that additional charges may apply for heavier books. We guarantee a safe, quick, and secure transaction. 10+ years in online bookselling experience. New York: KNOPF, 2010. Book. Very Good +. Hardcover. Signed Copy. First Edition/First Printing. A solid tight clean copy with some light reading wear. The priced jacket has some lightish rubbing else fine. Book three of the Dragon Tattoo trilogy. Great book, great series, great author. This copy has been signed by the translator Reg Keeland. The purchase of this copy includes a copy of my ticket to the event and a picture of him signing books. THIS COPY IS IN MY POSSESSION AND NORMALLY SHIPS NEXT DAY..
2012-07-03. Good. Ships with Tracking Number! INTERNATIONAL WORLDWIDE Shipping available. May not contain Access Codes or Supplements. May be ex-library. Shipping & Handling by region. Buy with confidence, excellent customer service! New York - Alfred A. Knopf, 2010 Book. FINE in a very g. Hardcover. First edition.. A US first edition of this novel by Stieg Larsson,translated fromSwedish by Reg Keeland. 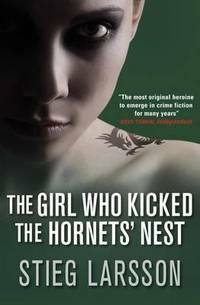 The Girl Who Kicked the Hornet's Nest is the third novel in Larsson'sMillenium trilogy, which includes TheGirl with theDragon Tattoo and The Girl Who Played with Fire. Condition: In a quarter cloth binding in original unclipped dustwrapper. Externally, in lovely condition. Dustwrapper is very smart with some handling marks. Internally, firmly bound. Pages very bright and clean. Overall: FINE in a VERY GOOD dustwrapper..
2009-08-08. Good. Ships with Tracking Number! INTERNATIONAL WORLDWIDE Shipping available. May not contain Access Codes or Supplements. May be ex-library. Shipping & Handling by region. Buy with confidence, excellent customer service! 2015-06-04. Good. Ships with Tracking Number! INTERNATIONAL WORLDWIDE Shipping available. May not contain Access Codes or Supplements. May be ex-library. Shipping & Handling by region. Buy with confidence, excellent customer service!